Provide comfort for the family of Clarence Brunty with a meaningful gesture of sympathy. 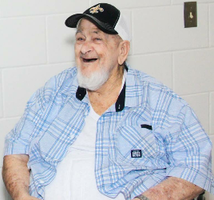 Clarence Lloyd Brunty, Sr. "Pops" 87, of Gautier, Mississippi went to be with our Lord on April 1, 2019 in Ocean Springs Mississippi. He was born in South Gate California. He was a resident of Gautier for over 40 years. He was preceded in death by his parents Clarence Earl Brunty and Lucilla Brunty. Daughter Marline Brunty and three grandchildren Sharon Kay, Tylen Brunty, and Madaline Lyon. Survivors include daughter Linda (Bobby) Walker of Bryan Ohio, Clarence (Regina) Brunty of Vancleave Mississippi, Julie (Milton) Wilson of Gautier Mississippi. Stepson Keith (Cynthia) Bex of Lucedale Mississippi. Step daughter Melissa (Stevie) St. Amant of Gautier Mississippi. Grandchildren Janice Milligan, Michael Walker, Marquis, Aj and Shelby Spears, Christopher, Alden, Desiree, Kahloni, Kamiya, Travis and Kendall Brunty, Gabe, Keith, Cholis, and Kyle Bex. Five great grand children. A host of nieces and nephews also a very special friend Meri Wells. He proudly served his country in the United States Army durning the Korean War. He worked at Mississippi Phosphate for over Twenty years and retired in 1998. Pops was a devoted father and grandfather. Every Saturday that he was off he would take us to the Doughnut Hole (no longer there) in Pascagoula then to the Pascagoula Beach Park and end up somewhere at one of his fishing holes to fish. Once retired if you knew "Pop" you could find him at the Gautier Bridge fishing. He loved to fish and make up lies. A graveside service will be held at the Biloxi National Cemetery on Friday April 5th at 11:00 AM. To send flowers in memory of Clarence Lloyd Brunty Sr., please visit our Heartfelt Sympathies Store.